Fugitive Catalan separatist leader Carles Puigdemont has said he is ending his bid to be reappointed president of Spain's north-eastern region. He said he was stepping aside in favour of detained activist Jordi Sanchez. Mr Puigdemont is in self-imposed exile in Belgium and has been told by Spain he faces arrest if he returns to Barcelona to be sworn in. 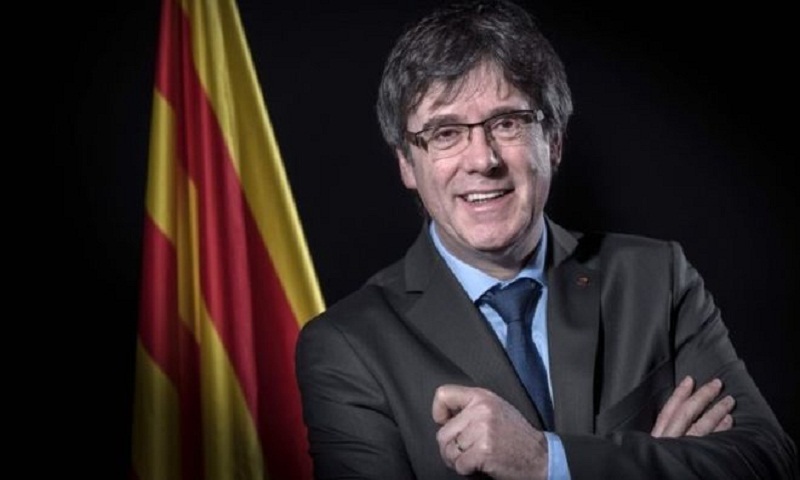 "I will not put myself forward as candidate to be appointed regional president," Mr Puigdemont said (in Catalan) in a video posted on social media. The 55-year-old said he was doing this in an attempt to unblock a political impasse following Catalonia's independence bid. Mr Puigdemont also posted a link to another video address (in English), in which he said: "We will achieve independence for the people we represent - that is our mandate and we will fulfil it." He said his lawyers had appealed to the UN human rights committee, accusing the Spanish authorities of violating Catalonia's right to self-determination. Jordi Sanchez is a former leader of the Catalan National Assembly, a grassroots movement advocating independence. Mr Sanchez, 53, and several other Catalan pro-independence politicians have been imprisoned in connection with the independence referendum, which was met with a heavy police crackdown and attracted global attention.